It was a chilly morning here in good ole West Chester, about 42 degrees. I love the Fall and cooler weather though, so it was good to me! Not much sun today though, cloudy and cool all day. Had a light Breakfast and a cup of Bigelow Decaf Green Tea as I got my Crock Pot Yankee Pot Roast and Vegetables prepped and in the Crock Pot. Not much going on today all caught up on everything, did some work on the computer and that was it. Have to be at the hospital in the morning as my best friend is going through a dangerous surgery tomorrow, praying for the best. For dinner tonight it’s Crock Pot Yankee Pot Roast and Vegetables. 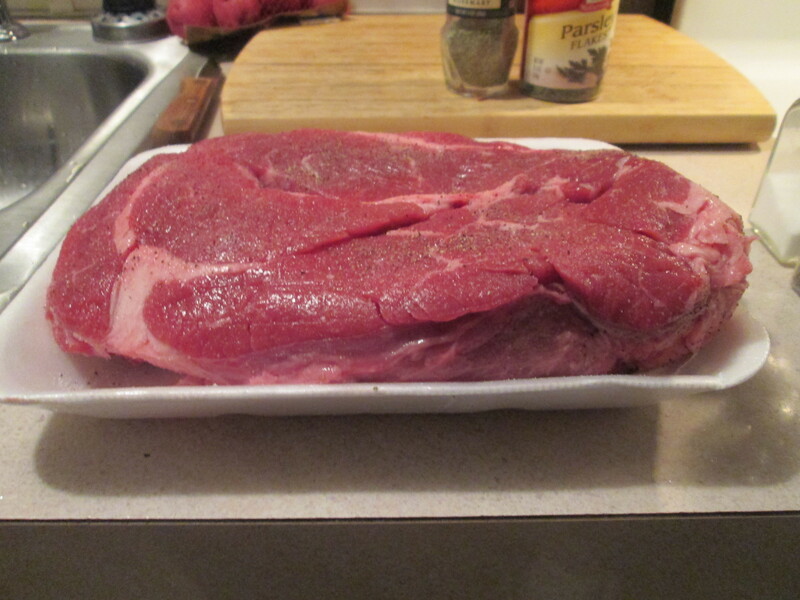 I purchased a beautiful roast while at Kroger yesterday, an Angus Pot Roast Cut (2.92 lbs.). I love the Kroger Meat Dept. over where I shop. They all know me, from going there so long, And always take care of me. it’s a very simple and easy recipe. I especially like using the Crock Pot for meals, the meat is always tender and no mess and easy clean up! There’s nothing but good things you’ll need to prepare this including; the Angus Pot Roast, Sea Salt and Pepper, Small Red Potatoes, quartered ( about 1 pound), 1 medium Onion (diced), 1 large Parsnips, cut into 3/4-inch slices, 2 Bay Leaves, 1 tablespoon Parsley, 1 teaspoon Dried Rosemary, 1 teaspoons Dried Thyme, 1 cup Red Cooking Wine, and 1/2 cup Swanson Low Sodium Beef Broth. I added the sliced Mushrooms about 1 hour before the Pot Roast was done. As I said I love using a Crock Pot. I got everything ready this morning and in the Crock Pot and just let it simmer all day, and the aroma throughout the day was just too good. Everything turned out delicious! Quoting my Mom ” I believe that’s the most tender and best tasting Pot Roast I ever had”. When I get a Mom approval like that I know I’ve done good! She said the same thing last time I prepared this also! The Pot Roast was tender and full of flavor and the Vegetables were the same way, the Red Cooking Wine and Beef Broth just enhanced all the flavors even more. A comfort food classic for sure. There was plenty leftover which will make some delicious pot Roast Sandwiches for lunch or dinner tomorrow! To go with the Pot Roast I baked a small skillet of Martha White Cornbread. Cornbread is something I think I could eat every meal. I like a nice fresh and hot slice with Butter on it. When I make this I just make it by the instructions on the package but I only use half the ingredients because I use a small cast iron skillet to make it. I use Egg Beaters and Extra Virgin Oil instead of Eggs and Vegetable Oil the recipe calls for. Bake at 450 degrees for about 25 minutes and you have some golden brown piping hot Cornbread! If you use a small cast iron skillet just cut the recipe in half and it comes out just right for the skillet size. * Season roast with salt and pepper. * Combine vegetables and seasonings in crock pot. * Place beef over vegetables, and pour broth and cooking wine over beef. * Cover; cook on LOW until meat is fork-tender (8 1/2-9 hours). * Remove beef to serving platter, and arrange vegetables around beef. * Remove and discard bay leaves. To make gravy, ladle the juices into a 2 cup measuring cup; let stand 5 minutes. Skim off and discard fat. Measure remaining juices and heat to a boil in small saucepan. For each cup of juice, mix 2 tablespoons of flour with 1/4 cup of cold water until smooth. Stir mixture into boiling juices, stirring constantly until thickened (about 1 minute). Sort of a long day, I had some routine blood work done a couple of days ago while at a checkup with my new family doctor and I was told today that the blood work came back showing an elevated Liver count. Which is more than likely being caused by the Cholesterol Meds I’m taking. But when I hear of something off or not normal it always brings back some real bad memories. Staying positive, go back to the Doc on Wednesday. Then on top of that I got a letter stating that my Anthem Medicare Supplement insurance was going up $12.02 a month. Plus because I’m not 65 no other options are available so I’m at their mercy, pay it or don’t have any. I’ve had better days! 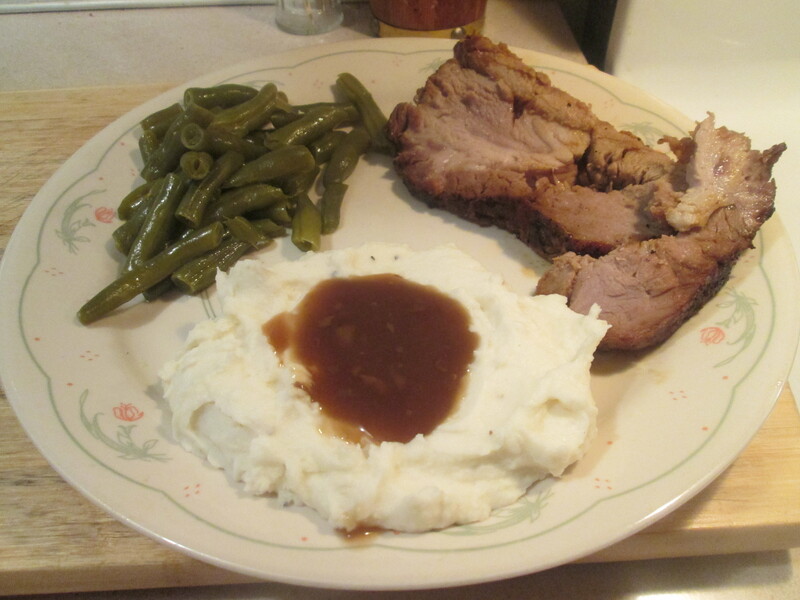 on a more positive note, for dinner I prepared a Pork Loin Boneless Roast w/ Green Beans and Mashed Potatoes. I purchased the Roast from Kroger yesterday, a Pork Loin Boneless Roast with a JB’s Fat Boy Premium Rub already on it. To prepare it I laid the Roast out for about 20 minutes to get it to room temperature. I placed the roast in a shallow pan and roast in a 350 degrees F. oven for 1 hour (about 20 minutes per pound), until internal temperature on a thermometer reads 145 degrees F. Removed it from oven; let rest about 10 minutes before slicing to served. It will serve about 6-7, with leftovers! The Roast came out moist and delicious, the JB’s Fat Boy Rub gave it a great flavor. The juice and drippings from the Roast were incredible! I also had a side of the JB’s Fat Boy Haugwaush Sauce on the side for dipping but used very little because I kept readding the juices and drippings to the Roast and it needed no other flavor or seasoning. I made a couple of sides to go with the Pork Roast, Mashed Potatoes, Brown Mushroom Gravy, and Cut Green Beans. The Mashed Potatoes were my favorite, Bob Evans Mashed Potatoes. The Gravy was Heinz Brown Mushroom Gravy and the Beans were Del Monte Less Sodium Cut Green Beans. A hearty and delicious dinner to end sort of a bad day. For dessert later a Skinny Cow Ice Cream Fudge Bar. The roller coaster weather continues. Lately it’s been single digit temperature or in the teens along with a wind chill and snow. Today about 50 degrees and rain. Ohio Valley weather, you gotta love it! 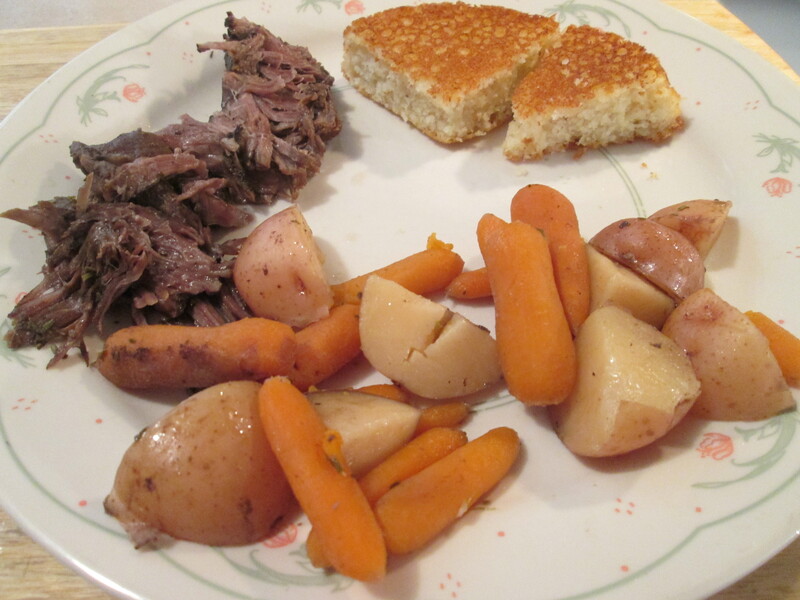 For dinner it was another new recipe for dinner, Crock Pot Yankee Pot Roast and Cornbread. I’ve been wanting to try a Yankee Pot Roast for a while now so today was the day. I purchased a beautiful roast from Kroger yesterday, an Angus Pot Roast Cut (2.78 lbs.). I love the Kroger Meat Dept. over where I shop. They all know me, from going there so long, And always take care of me. Very simple and easy recipe. 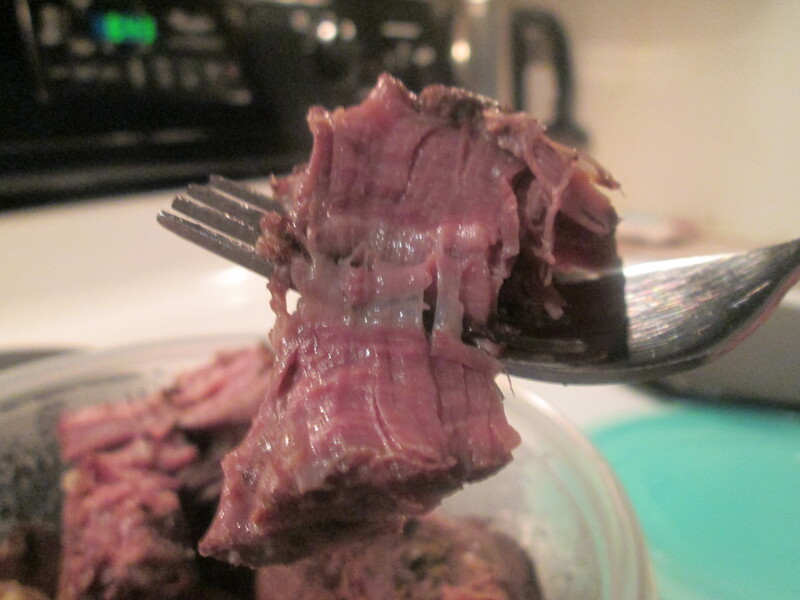 I especially like using the Crock Pot for meals, the meat is always tender and no mess and easy clean up! There’s nothing but good things you’ll need to prepare this including; 2 1/2 lbs Angus Pot Roast, Sea Salt and Pepper, Small Red Potatoes, quartered ( about 1 pound), 1 Small Bag Mini Carrots, Sliced Mushrooms (optional), 1 large Parsnips, cut into 3/4-inch slices, 2 Bay Leaves, 1 tablespoon Parsley, 1 teaspoon Dried Rosemary, 1/2 teaspoon Dried Thyme Leaves, 1 cup Red Cooking Wine, 1/2 cup Swanson Low Sodium Beef Broth. I added the sliced Mushrooms about 1 hour before the Pot Roast was done. As I said I love using a Crock Pot. I got everything ready this morning and in the Crock Pot and just let it simmer all day, and the aroma was just too good. Everything turned out delicious! Quoting my Mom ” I believe that’s the most tender and best tasting Pot Roast I ever had”. When I get a Mom approval like that I know I’ve done good! 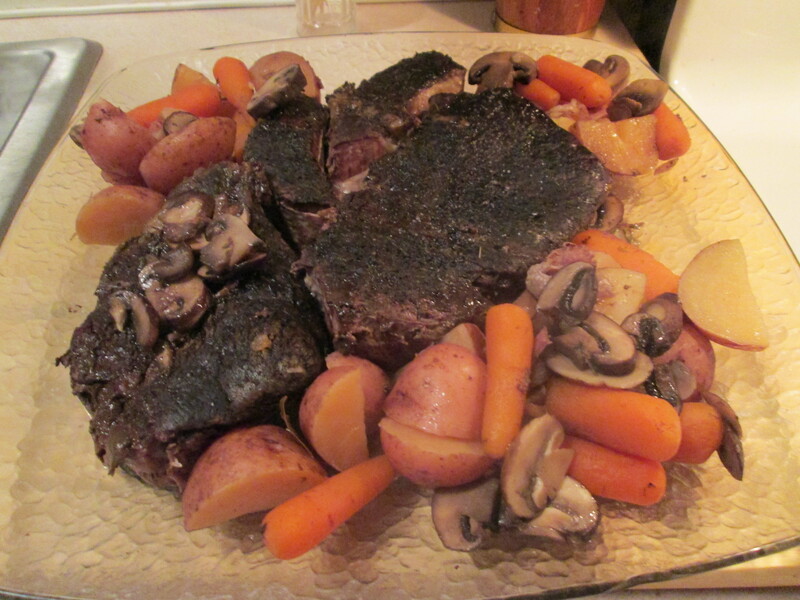 The Pot Roast was tender and full of flavor and the Vegetables were the same way, a comfort food classic for sure. I know a lot of the Pot Roasts contain Onion and Celery but I’m just not a huge fan of either. There was plenty leftover which will make some delicious pot Roast Sandwiches for lunch or dinner tomorrow! Nothing better than piling the Pot Roast and the Veggies on Whole Grain Bun and using the Juices that were leftover, heating it up and add flour to thicken it up. Then top the Sandwich off with Drippings Sauce, Yeah Buddy!! 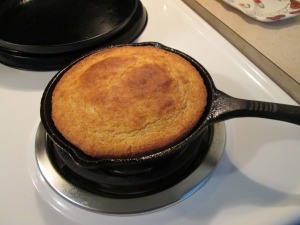 To go with the Pot Roast I baked a small skillet of Martha White Cornbread. Cornbread is something I think I could eat every meal. I like a nice fresh and hot slice with a Butter right through the middle of slice! When I make this i just make it by the instructions on the package but I only use half the ingredients because I use a small cast iron skillet to make it. I use Egg Beaters and Extra Virgin Oil instead of Eggs and Vegetable Oil the recipe calls for. Bake at 450 degrees for about 25 minutes and you have some golden brown piping hot Cornbread! If you use a small cast iron skillet just cut the recipe in half and it comes out just right for the skillet size. For dessert later a Jello Sugar Free Dark Chocolate Pudding. Simple, easy, and delicious! I used the leftover Pork Roast to make some delicious Pork Roast Sandwiches. You can check yesterday’s post on dinner to get the recipe for the Pork Roast and it is a good one! The Roast was enjoyed by everyone yesterday, I’ll be using it again often. Back to today’s dinner. I warmed the Pork Roast and sliced upo thre remaining Roast. It was just as delicious the second time around, still moist and tender! I served it on a Healthy Life Whole Grain Bun. Along with the sandwich I had a new side, Veetee Dine In Basmati & Wild Rice. Came across this at Kroger. Easy to fix just peel back the plastic covering halfway and microwave on high for 2 minutes. Very good tasting and very fresh, look forward to trying their other Rice dishes. I left the item description along with it’s web link at the bottom of the post. For dessert later a Jello Sugar Free Chocolate Pudding topped with Cool Whip Free. The grains of natural white Basmati rice, famous for their delicate aroma and fluffy texture have been carefully blended to compliment the nuttiness of the black wild rice. These two rice grains combine together to create a dish which offers different flavours and textures with every mouthful. Veetee Dine In Basmati & Wild Rice is delicious served with Oriental style dishes, chargrilled meats or used in a rice salad dish. It was just as good the second time around! 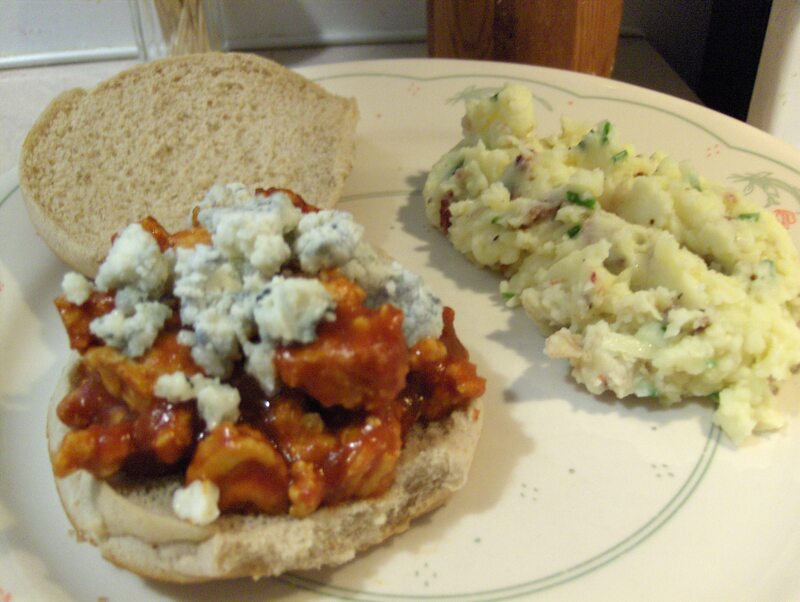 I warmed up the Sloppy Chicken Joes and the Mashed Potato Skins. You can see the recipes for both on yesterday’s posting. Dessert later Breyer’s Carb Smart Vanilla Ice Cream with a scoop of fresh Blueberries. Slow Cooked a Dill Pot Roast, put it in the crock pot this morning and cooked all day. You can also serve Noodles as a side dish with it I chose not too. Made a side of Cornbread Ears. The recipe follows for the pot roast. Cook 5 to 6 hours (high), or 10 to 12 hours (low). 1. If necessary, cut roast to fit into a 3 1/2- or 4-quart slow cooker. In a large skillet, brown roast on all sides in hot oil. Transfer roast to slow cooker; add the water to slow cooker. Sprinkle roast with 2 teaspoons of the fresh dill or 3/4 teaspoon of the dried dill, the pepper, and salt. 2. Cover and cook on low-heat setting for 10 to 12 hours or on high-heat setting for 5 to 6 hours. Transfer roast to a serving platter, reserving juices; cover roast and keep warm. Pour cooking juices into a glass measuring cup; skim off fat. Measure 1 cup of the reserved juices. 3. For sauce, in a small saucepan, stir together yogurt and flour until combined. Stir in the 1 cup reserved cooking juices and remaining 1 teaspoon fresh dill or 1/4 teaspoon dried dill. Cook and stir over low to medium heat until thickened and bubbly. Cook and stir for 1 minute more. Serve sauce with meat. 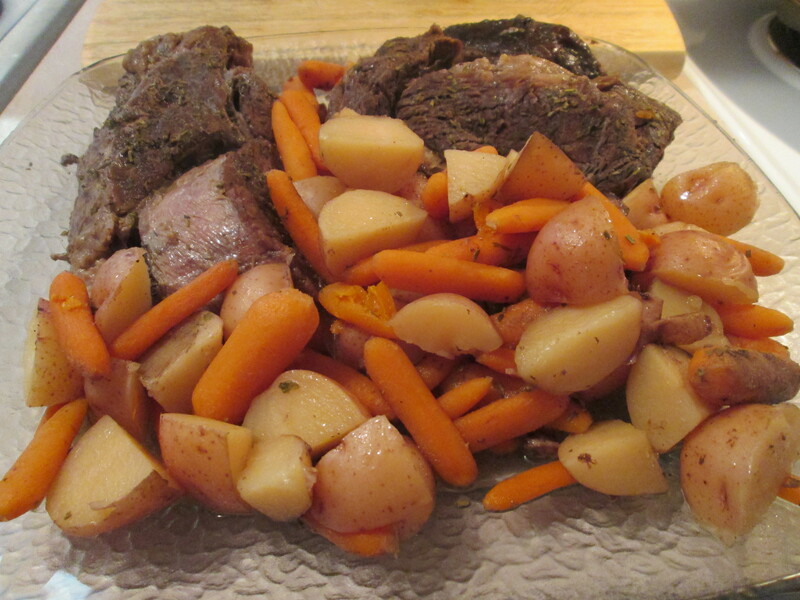 I found a good St. Patrick’s Day recipe to pass along for those with Diabetes, Diabetic Irish Beef Pot Roast with Vegetables. Also a little Irish blessing to go along with the meal. 1. Prepare pot roast vegetables: cut potatoes in half (or into quarters if large), onions into 1/2-inch wedges, and carrots and celery into 2-inch pieces; set aside. 2. Combine gravy mixes, flour, salt and pepper in large bowl. Add vegetables to bowl; toss to coat well. Remove vegetables from flour mixture and place in 5 to 6-quart slow cooker. Add beef roast to bowl, turning to coat evenly with flour mixture. Remove roast and place in slow cooker in center of vegetables. 4. Remove roast and vegetables. Skim fat from gravy. Carve roast into thin slices. Serve with vegetables and gravy. Sprinkle with parsley, if desired. Another good one from Taste of Home! The recipe calls for 1 Tablespoon of Brown Sugar, you could use Splenda Brown Sugar instead.